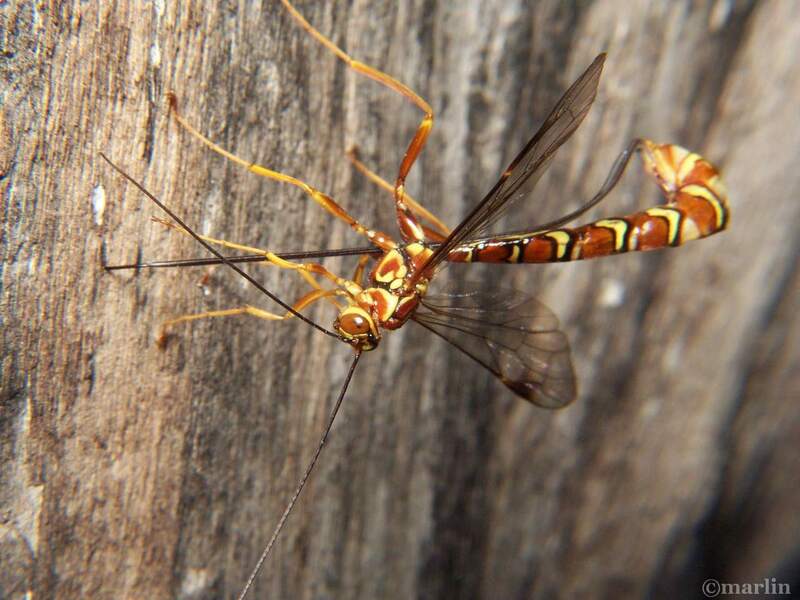 This giant ichneumon wasp drilled her ovipositor, or terebra, 1-1/2 inches deep into solid wood, and laid an egg in the course of 4 minutes on a lovely, early spring day in the American midwest. Wandering over the surface of a fallen log, continually contacting the wood with her antennae, she “smells” her prey: larvae of the horntail wasps which live inside the wood. This wasp spent a full 10 minutes prospecting before she began to drill. 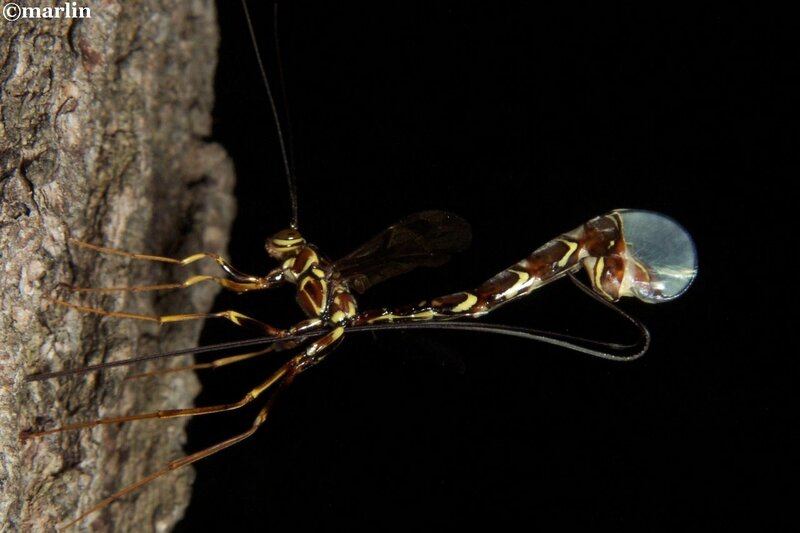 At this point, her ovipositor (egg-laying device, the long, thin threadlike object trailing to the right) is “fully assembled” and appears as a solid-looking, threadlike structure extending fully 2 inches behind her. She is about 90mm long (3.5 inches) including ovipositor. As the drilling begins, she raises the tip of her abdomen until the terebra is perpendicular to the surface, then begins pushing the tip into the wood. The abdomen sort of splits open as the two outside “guides” begin to separate and loop back on either side of the abdomen, to allow the abdomen to push closer to the surface. The ovipositor is now almost fully inserted, and the abdomen has opened up like some kind of ghastly sofa-bed. The terebra consists of 2 guides, or two halves of a sheath which “unzip” at the top, and a gizmo which rides in between them. Other brands of wasps, e.g. some Braconidae completely separate the sheath when the egg-layer is in action. However, those wasps are depositing eggs in flowers and soft material; they don’t need the piercing power of the Megarhyssa apparatus. Scientists are still not sure how the wasp “drills.” It is thought vibration might be involved but no one is sure. I suspect the tip of the terebra is sharp and the wasp forces aside the “soft” tissue of the wood much as you would push a needle into cork. 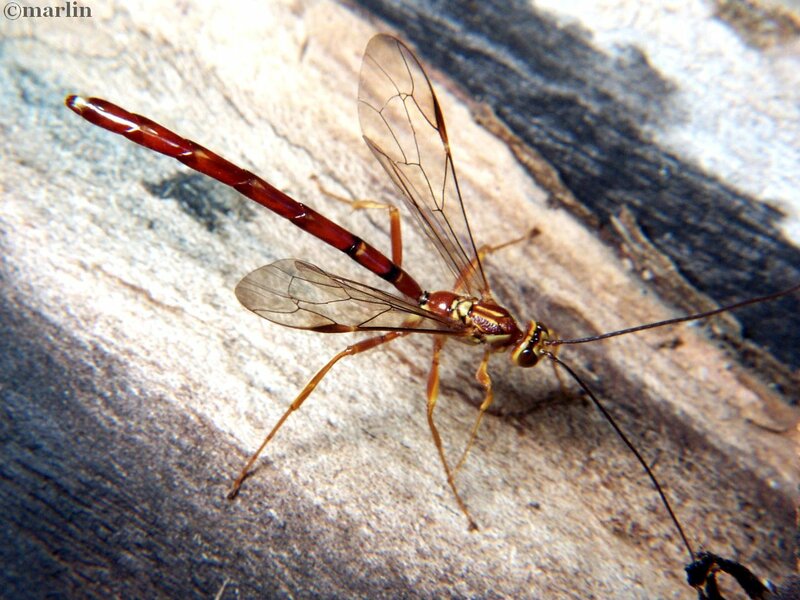 I have seen ovipositors hanging from tree trunks, sans wasp. Evidently, the poor female sometimes flies away without her egg-layer, much as a honeybee commits the ultimate sacrifice in defense of the colony when she leaves her stinger in your arm. It amazes me. How does that wasp know exactly where and when the egg must be laid? For it must be laid inside the cell of the alien larvae – sometimes laid directly on the body of the prey, sometimes inside the host larva, where it will develop and eat the host from the inside out. It is for that very reason that Ichneumon females will dump their eggs in flight, like an airliner jettisoning fuel, if they cannot find prey to host their brood; otherwise the eggs would hatch and the children would devour her from the inside out. Talk about sharper than a serpent’s tooth! The great Charles Darwin came up against one of the greatest tests of his religious faith when studying the Ichneumonidae and contemplating their seemingly evil and cruel ploy for exploiting other creatures; he thought the monstrosity too evil for God to have thought of it, much less condone. When the wasp senses the tip of the ovipositor in contact with the host larva, she injects the egg through the hollow tube. After the egg hatches, the young ichneumon wasp larva feeds on the horntail larva and then pupates inside the cell or gallery. When mature, it chews its way out and begins life as an adult — and the boys are waiting. Adult male wasps are adept at discerning wood-chewing vibrations, and they use their antennae in to detect the pheromones of the emerging virgin queens with which they hope to mate (below). 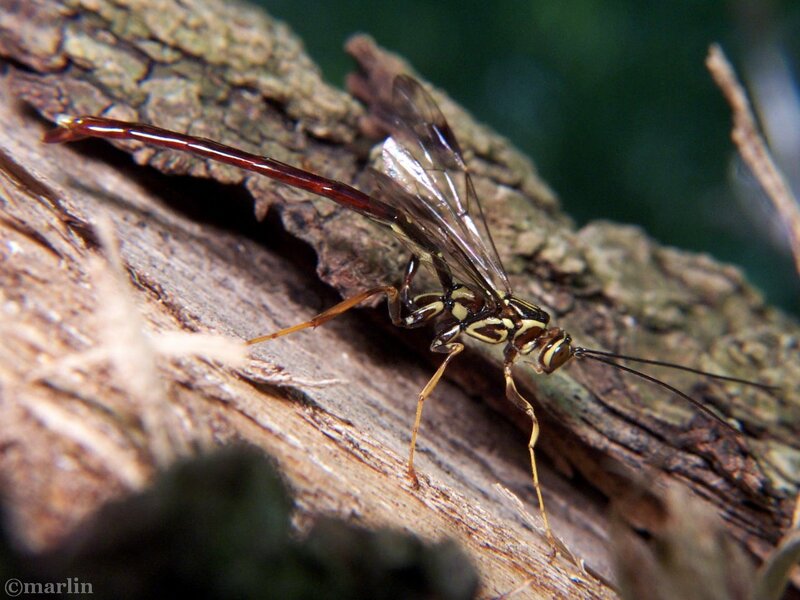 Male Megarhyssa wasps gather at trees or fallen logs where female wasps are emerging in springtime. They seek to inseminate the females by either of two methods – waiting for them to emerge, or actually inserting their abdomens into the hole from which the female will shortly emerge. Males do not have stingers or ovipositors. I see males congregating and jockeying for position at the same places I see females laying eggs. In nearly 15 years of photographing insects, I have only caught them in the act on two occasions, and have only seen a handful of specimens all told. Rare indeed is this intriguing creature!